Recently I had The pleasure of Interviewing Las Vegas Headliners Stage Hypnotists The Naughty Boys of Hypnosis. These Guys have an Extremely Funny show and showcase some Awesome Hypnosis Talent as well as a great message of Personal Development. Corbin J. 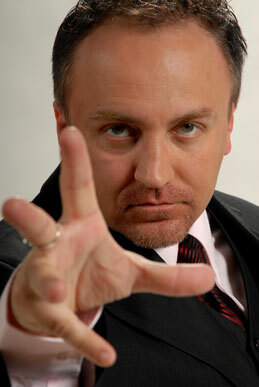 Craft, aka "The Mad Hypnotist", has been thrilling Las Vegas audiences for years. Has headlined his own show at the famed Tuscany Hotel in fabulous Las Vegas, Mr. Craft performed to sold out showrooms nightly. A balance of humor, mystery, and perfect timing blend the "Naughty Boys Hypnosis Show" into a delightful experience all can enjoy. When asked how he flawlessly continues to entertain night after night, Corbin replies, "The stage is in my blood and my audience is the body through which it flows." Indeed the stage is in Mr. Crafts blood. Son of lengendary Vegas stage hypnotist "Dr. Naughty", Corbin has been living this lifestyle all his life. Corbin Jay Craft is a certified practitioner of Clinical Hypnotherapy, Neuro Linquistic Programing, and Time-line Therapy. Rolan Whitt has been an entertainer since the early 90's. He started out doing stand up comedy and has since done dinner theater, improvisational theater, commercials, independent films, and written for national touring comedians including Jay Leno of The Tonight Show. Before becoming a stage hypnotist, he was opening the Dr. Naughty Show by getting spanked by all the women in the audience. Naughty loved this so much, he insisted that Whitt assist with the show, and then insisted that he become Dr. Naughty the 3rd. Apparently hypnotized, Whitt agreed and has done hundreds of shows since. Now, he and brother of hypnosis Corbin Craft are branching out keeping their naughty nature alive and kicking as the Naughty Boys of Hypnosis. I found it so refreshing to speak with these guys and learn about The Famous Dr Naughty and their beginnings into a successful career as Las Vegas Headliners of their Funny Hypnosis Show. If you are ever in Las Vegas come out and see them you will have a blast I have been to see the show several times and it is always different and always funny. On top of all of that they are some of the nicest people to know and I like them so much I am putting it on my calendar to bring My NLP and Hypnosis Students out as a group to have a fun night with them and see a Great Hypnosis Show in Action. For the Extended version and full interview please click on the Link below to access the full interview and Watch and Listen as they share their experiences with us.